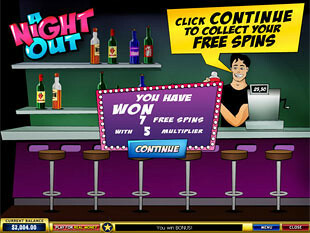 A Night Out Slots is a 5 reel 20 paylines video game released by Playtech. Dive into the atmosphere of joyful party with plenty of drinks to try and a lot of beauties to admire. It is just another opportunity to forget about the every day life style and enjoy amazing dances combined with astonishing prizes. With the top jackpot of 10,000 coins that can be increased enormously during bonus game and Free Spins this slot provides you with the opportunity to have really exclusive party. Extra progressive jackpot also makes this slot more thrilling. The other good thing to consider is that this slot is available in no download version. In other words, you can play it directly through the browser from any computer without installing casino software. The night of sparkling lights and illuminated faces with bright cocktails to create a good mood and win more prizes to enjoy. Try to get some icons of stunning ladies to be engaged in a flirtation and make your mood even better with better awards to appreciate. Such bright and stylish icons as Brunette, Blonde, Ginger, Pina Colada, Margarita, Tequila Sunrise, Kiwi Tropic, Whiz-Pear, Pilsner, Dancing Ladies, Barman can make our spare evening more entertaining and full of prizes. This penny slot allows you to cover all 20 lines with $0.20 only. Playing with all 20 lines you increase you chances to win. There are also such coin sizes to choose from as $0.01, $0.05, $0.1, $0.25, $0.5, $1, $2.00. 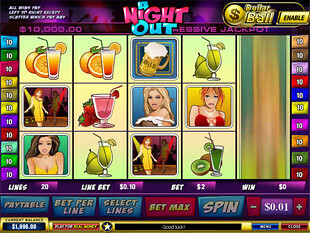 As you can see high rollers can also appreciate this slot, because it allows them to play with the maximum bet of $400. Just choose the best option for you and enjoy. The highest jackpot is 10,000 coins or $200,000 for 5 Pilsner. The second jackpot is 1,000 coins or $20,000 for 4 Pilsner or for 5 Blonde. The third highest jackpot is 500 coins or $10,000 for 5 Ginger. Pilsner is the wild symbol. It can substitute any other icon except the scatter to produce more winning combinations for you. This tasty drink can also bring you the top award of this game that is 10,000 coins or $200,000. So, try to “order” it more often. Dancing Ladies is the scatter symbol. By getting 3, 4 or 5 Dancing Ladies on the reels you multiply your total bet by 5, 10 or 50 times accordingly. In other words, you can win up to $20,000 for these pretty ladies in case you bet maximum $400. Let’s enjoy this party and try to win the best prizes to continue entertainment. Bonus Game. All you need to make your game even more exciting is to get Barman icons on the reels 1 and 5 at the same time. 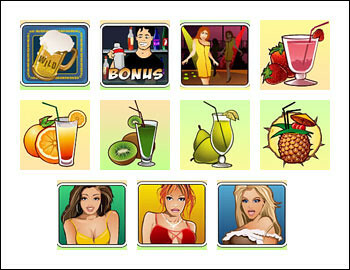 Now you should choose among several girls to dance for you and indicate number of Free Spins. 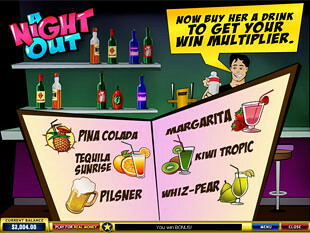 Then you should choose the tastiest cocktail to treat yourself or this lady as you wish and find out the multiplier you win during Free Spins. Thus, as you can see we won 7 Free Spins with 5x multiplier. There was the opportunity to win up to 50,000 coins or $1,000,000 for 5 Pilsner during this feature. So maybe you will be luckier next time. Activate Lotto Madness Dollar Ball game and get the opportunity to win Progressive jackpot. This time you need to select 5 number out or 49 provided. In case you guess all 5 numbers you will win progressive jackpot. Just look at the ticker above the reels to find out how much you can win and rely on your sixth sense. 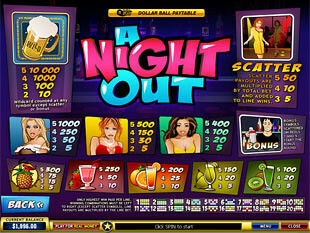 A Night Out slot machine is an amusing game with incredible prizes and various bonus features to make your mood better. Try to activate bonus game and enjoy pick a prize style game with Free Spins awarded to increase your winnings.